Spinning today in the 'rock room' is a vintage 7' single from Ronnie Lane and Slim Chance. 'The Poacher' was released in May of 1974 in conjunction with Lane’s debut solo album, Anymore for Anymore where the song also can be heard as an LP track. The song, similar in scope to much of Lane’s work, is a visual narrative packaged in a lilting and moving aural framework. 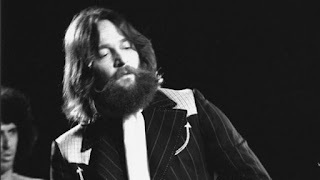 Lane, of Small Faces and later Faces fame had left his band Faces in mid 1973 after an exciting run of fame, decadence, booze, travel and power. These aforementioned factors had never meant much to Lane who was more interested in a simple life focused on farm work, family and friends all while composing and playing music no matter the size of the crowd or the reaction of the critics. 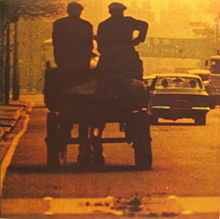 This 1974 single assimilates Lane's new found freedoms as a solo artist and family man at his Fishpool Farm in Wales. Lane put together the band ‘Slim Chance’ after his defection from Faces with the design to create unpretentious home grown acoustic oriented music established by British folk elements, music hall aesthetic and his own melodically constructed musical compositions. Lane’s music always stood out on the Faces early 1970 LP’s in stunning contrast to Rod Stewart and Ronnie Wood’s compositions due to his gentle and wry lyricism, his pastoral thematic ideas and his hymnal melodic qualities. Toward the end of the band's initial 3 year peak Lane was feeling that his time with the Faces had caused him to compromise some of his musical integrity. By the time mid 1973 rolled around Lane was leaving the group and beginning to create music on his own terms and based on his own merits. 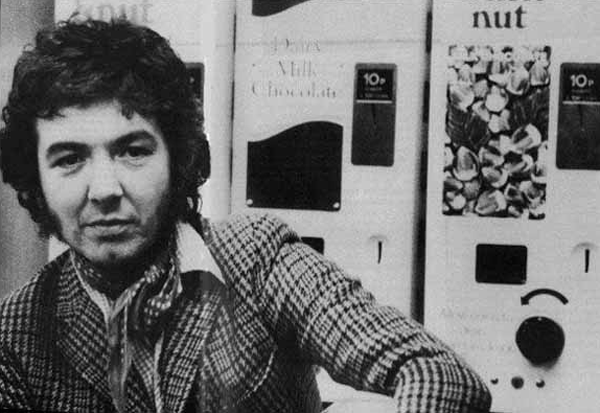 Ronnie Lane and his cronies in 'Slim Chance' unearthed each others musical roots allowing Lane to soak up the spotlight of the sun once obscured by bigger and more eager musical comrades. The instrumentation for Lane’s new band line up was as special as their songs; banjos, mandolins, violin, dobros and accordions decorate much of the group’s music. In addition to woody and eclectic instrumentation many of the songs for Anymore for Anymore were recorded right outside in Lane’s Fishpool fields via the Ronnie Lane Mobile Studio. 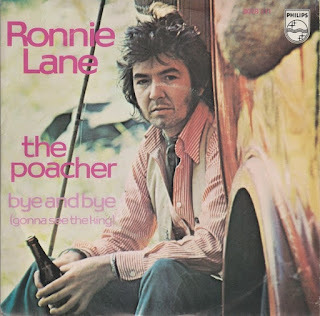 Lane’s single ‘The Poacher’ b/w ‘Bye and Bye (Gonna See the King) assimilates all of the aforementioned elements that not only make Lane’s songs unique but also epitomize the effortless attitude and rustic song construction he longed to express. ‘The Poacher’ begins with the anticipatory gallop of a brisk hi-hat and a sparkling acoustic strumming that massages the resonant call of the songs central melody played on oboe. The melody repeats, folded over like a delicate a bird song. Sweetly seasoned strings (double fiddles?) rise and fall with the levels of the rolling musical river that we visit. The lyrics tell the tale of Lane early morning excursion into his woods where he comes upon a solitary woodland traveler (the world's first poacher) established with his box of tackle and focused on the river, deep in contemplative concentration. Lane’s double tracked vocals quiver like suspended leaves tickled by the backcounry breezes that have been conjured by the rhythmic bounding of the tune. He sings the descending vocal line balanced on the edge of his range while inspired by the swirling arrangement. A a whistling keyboard appears gently in the mix hovering. Well timed lowly groaned vocal dressings alternate underneath it all while separating the verses. You can hear footsteps approach, smell the decomposing soil and sense the slow gurgle of the river. The mystical narrative enters into the consciousness of the poacher who not only transcends time and exudes a simple existence. Lane’s beliefs are reflected in the character that has no need for the trappings of the mainstream world, riches, power, or the exposing of this heart, only with the chance to be broken. The ‘poacher’ is content with the unchanging flow of the water and the hopefulness that the river will provide a bounty through his fishing. His position reflected in the lyric, ‘bring me fish with eyes of jewels and mirrors on their bodies, bring them strong and bring them bigger than a newborn child’. The indistinguishable blend of vocal, lyric and arrangement draws the picture Lane has created in vivid swaths of color. Conflict over the character of the man described by Lane is also played out in the title of the song. Generally, a ‘poacher’ is involved in activities that may not always be sanctioned by law. While the man is sketched as simple and noble, can we be certain his actions are honorable? Such is what makes the song so wonderful, the openness for interpretation. Anyways, I digress, the song continues and the musical vista created by Lane moves through the multiple organic currents of his arrangement. Lane's earnestness of voice creates an enduring image and states it in a magically uncomplicated way. 'The Poacher' proceeds to build on its melodic mantra where the strings and organ begin to intertwine while racing ahead of the song and then falling slowly back in line, cars on a train line. Truly the alchemy of the song is to be found in the unhurried relationship between the racing rhythm and patient melody lines that tighten and slacken naturally. The song states its story and fades away on its sturdy melody that three and a half minutes earlier it had used initially to usher us in to the tale. It amazing to me and I’m sure to others that Lane’s music and in particular ‘The Poacher’ did not reach a larger audience. When released it did reach into the top 20 in the UK respectably. But as is so often the case, posthumously Lane’s talent and influence have been re-inspected and given their due respect. Oddly enough, it was never about critical acceptance for Lane, it was about music that touched you deeply no matter the venue or element of transmission. His ‘Passing Show’ tour where he moved through the English countryside with a traveling circus playing in a tent should be acting proof of this! ‘The Poacher’ is one of numerous ‘small’ Lane masterpieces and stands stoically in his catalog as proof of his foundations as well as a capture his superior musical talents.